This tasty fresh dish was created by Romain Van Durmen, Chef De Cuisine at The Chefs Palette in Fairmont The Palm. 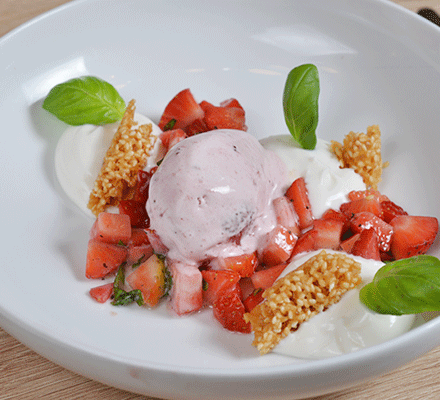 For this recipe you’ll need London Dairy Natural Strawberry ice cream. Make the most of your enjoyment with these eye-tempting pieces of strawberry in combination with delicious strawberry ice cream. Available as 120ml Cone, 125ml Cup, 500ml Tub, 1l Tub. Put the milk in a pot, with the sugar and agar-agar and heat on the stove. When the liquid is boiling, pour it on the top of the goat’s cheese and blend it. Reserve in the chiller until cold. Blend it again, until you have a smooth preparation. Pour the mixture into a piping bag and keep chilled. For the strawberry salad, cut the strawberries into cubes and season with chopped basil with a little bit of pepper. To serve, dress the plate with goat’s cheese cream, the strawberry salad, London Dairy Natural Strawberry ice cream, and some crisp.